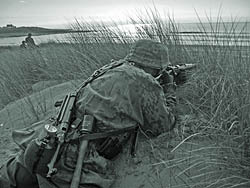 The concept of reasonably authentic WW2 airsoft games was born in the summer of 2006. While there had been some WW2 events organised they were few and far between and they were really best described as “WW2 themed” games rather than attempts at recreating real events and actions. A group of five airsofters, three of whom regularly played at open days in WW2 kit (of which I was one) got together and called themselves Comrades in Arms and set about working out how a large scale full day WW2 event could be put together. We knew dotted all around the country there were players with WW2 uniform (mostly US airborne) who were itching to use the kit outside of an open day game. The problem was there were too few who had German kit to make a viable opposing side so we put together a ‘looks-like’ kit list that enabled players on all sides to put together kit that looks the part from 20ft away and didn’t cost a fortune. The surprise was that, come game day, most turned up in very authentic uniform – much of it bought especially for the day! The concept was now proved, the Catch-22 (there being no WW2 airsoft games due to too few players with authentic kit and yet too few players because of the lack of games) was now broken and players were gagging for more WW2 games. 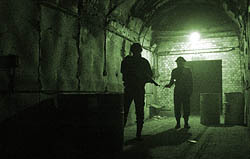 In the intervening five years, more and more games have been organised, both by established airsoft site operators such as Players of War Airsoft, Shoot ‘n Scoot and Gunman Airsoft as well as player groups such as Poor Bloody Infantry and Army Group South. The busy calendar sees regular WW2 games organised in Scotland and games played from Dorset to Yorkshire and all over Wales too. The advantage of a wide spread of organisers is that every game is different, each with a different emphasis – some might have a very specific and accurate historical basis, others might be a “what-if” scenario; some might be ‘hot’ on uniform accuracy, others might be more accommodating to what you already have in the cupboard. One thing that has grown is the sense of community – uniforms and guns will be lent to complete strangers to enable others to participate, quite extraordinary when compared to regular airsoft. Even though there are games across the year and across the country, you will never get to a game if you wait for one to come to your doorstep – so some travel is inevitable, and here again fellow players are happy to give lifts to others. One of the great boosts to the WW2 airsoft genre in recent years has been the increasingly wide availability of cheap and authentic uniforms, and the ever expanding range of WW2 weapons. Back in 2006 for the first ever Comrades in Arms WW2 game just about the only affordable WW2 weapon was the Toyko Marui Thompson and I think we can claim that we had the most Thompsons ever seen in a game at the same time! These days with the advent of Chinese-made guns, MP40s, STG44s and Stens are everywhere along with K98s, Garands, MG42s and a fair sprinkling of more exotic custom-made guns. As the WW2 airsoft scene has expanded and diversified, so the internet presence has changed. 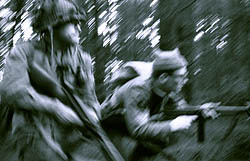 Today, the WW2 Airsoft website (www.ww2airsoft.org.uk) has the latest in WW2 game and kit news and its associated forum (run by the author independently of any organiser, organisation, site or manufacturer) aims to bring everyone together and provide a central hub of information, a focus for the community and links elsewhere. And it is not just used by those in the UK, as there is quite a bit of interaction and flow of information between overseas WW2 players too. There is plenty of information provided by the traditional WW2 re-enactment world as boundaries between airsoft and traditional re-enactment private battles become blurred. WW2 airsoft has developed a game-style all of its own and this might come as a bit of a surprise to those more used to open day airsofting. The pace is much slower and concentrates less on trigger time and more on teamwork, less on emptying hi-cap after hi-cap and more on fulfilling objectives. 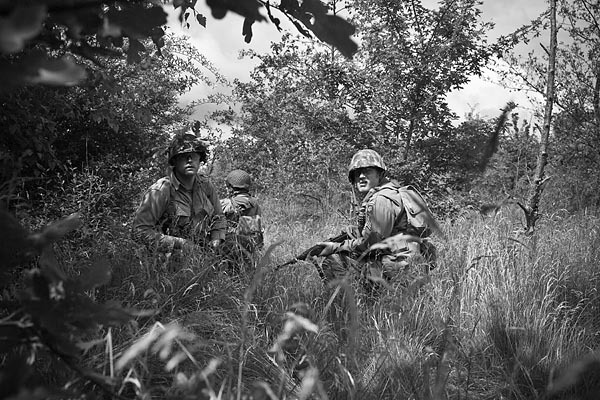 Frankly, there isn’t really a use for ‘lone wolf’ players in WW2 airsoft – players are given orders, work in squads, often doing everything possible to avoid contact with the enemy, unlike open days where constant contact is the name of the game. It isn’t unknown for a player to return home after a weekend’s play having not fired a shot in anger yet still buzzing with adrenaline having run the enemy ragged. Games are run at airsoft sites and Ministry of Defence army training grounds all over the country, hired for the day or weekend. They are chosen for their suitability to a scenario so a quarry would make a great North African or Italian battle, a disused factory becomes Stalingrad, an underground tunnel complex becomes a secret German aeroplane factory, a pine forest becomes the Ardennes. One of the great pluses of following WW2 airsoft games around the country is that you get to play at some truly remarkable and unique airsoft sites. So, if you feel like giving WW2 airsoft a go, where do you start? Well, you don’t start by hammering websites with the credit card! 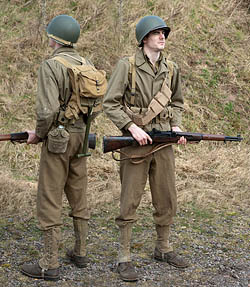 And while Band of Brothers and Saving Private Ryan are excellent entertainment, a US airborne outfit will see limited use in WW2 airsoft games. Generic is the key. WW2 game scenarios span the entire war so ideally you need something along the lines of an unbadged infantryman. Don’t bother with arm badges or other adornments, plain field-grey wools for German, M41 jacket and mustards for American, wool battledress for British, and so on. Then look to your head, a helmet should be next on your list. In WW2 the combatants had distinctly different uniforms from each other and it becomes very easy to spot a Tommy or Landser in the distance by his headgear profile. So much better than red or blue-taped arms to distinguish the sides at open days! Once these basics are in place THEN start spending money on the useful extras – webbing, gaiters, boots, camouflage and so on. Don’t bother with officer gear, your game organisers will be the officers so no point outranking them! It is easy to fritter cash away on bits and bobs where as it is much better to accumulate cash and buy essentials only – and, as always, if you buy the best you only buy once. The WW2 Airsoft website has pictorial kit guides that illustrate all the components needed to put together a convincing ‘loadout’ (to use the airsofter’s parlance), along with sources and prices. And weapons? In an ideal world a wood-stocked rifle would be ideal (K98, Garand, Mosin Nagant, Enfield No4 etc) as rifles predominated in WW2. You shouldn’t feel outgunned using a bolt action but it can be a bit of a leap for former open-dayers to ditch the automatics so Thompsons, MP40/44s and Stens are cheap and considered generic by means of ‘captured’ weapons. Handguns aren’t really needed unless you are using a 350+fps bolt action which has a minimum engagement distance. The WW2 Airsoft forums are full of bargains for sale, from hard to find bits of specialist kit to full loadouts – so no need to pay full whack shop prices unless you have a fat wallet. Do remember that what matters most is that you get from behind the computer and off the sofa and participate in the games – pukka kit is very much secondary. Some people get things the wrong way round and obsessively collect kit trying to perfect a loadout and never actually get out and play. To the fighting soldier, a uniform is just his working clothes, no more no less; they had much more important things on their minds. Don’t feel you have to go with a mate; you will come away after the event with 30 or 40 mates. Your fellow players are often more than happy to lend out spare uniforms or weapons, some organisers even offer free uniforms and hire guns, so there really is no excuse not to dive into the forums, book on the next game and plunge yourself into the immersive and unique world of WW2 airsoft. All WW2 games are held at weekends, either run over one day or two and almost always have a social evening where you will discover that whether you are a first-timer or an old sweat, all are accepted equally and with enthusiasm and you will find the next event can’t come quick enough!